When the Teaching Assistants led the class on March 11, 2019, I did not know what to expect. When they began with a Human Clay exercise I was confused and felt out of my comfort zone. This activity required three people in a group: one person as the sculptor and the other two as the clay. The sculptor would mold their clays into the word that the TA’s instructed. Then, after forty-five seconds of working with the clay, the sculptor was able to walk around the room to view how other people interpreted the word. The words given to us in class were: difference, unity, conflict, grounded, peace, aliveness, and care. I chose to be a clay first to see how the process was. After my group member Corinne did the first word, I felt comfortable to become a sculptor. The word I first sculpted was unity. For this, I had my two clays have their fingers interlocking with each other. Walking around the room and looking at other people, I saw that others had their clays interlocking arms or hugging. Although they all had a different body movement they were all connected by being in close proximity and blending the human clays. My second word clay was peace. For this I instructed my clays to cross their legs on the floor, looking at each other and holding up peace signs. When I walked around the room people’s perception of the word varied. One group had their clays sharing food, the other sitting in a meditation state on the floor. When the TA’s gave us the time to reflect I pondered on all of the words given to us. Why did my TA’s for this course choose these words and not other ones? Then, it clicked! All of these words connected to Steve Prince’s compositions and the anthology Walking Raddy: the Baby Dolls of New Orleans. These seven words connect to the anthology specifically with Baby Dolls. In the anthology, the writer delves into how the Baby Dolls are grounded with their culture and heritage in New Orleans. This is shown through music and their dancing. They are also a unity of people working to address societal conflict in New Orleans such as racism and sexism. Although they are representing unity, the Baby Dolls accomplish this through different freedom of expression with dancing in the streets of New Orleans. This can be seen in the chapter “From the Bamboula to the Baby Dolls: Improvisation, Agency, and African American Dancing in New Orleans” with the influence of West African Congo Square dancing. With these dances, the Baby Dolls are able to “express aliveness through asymmetry and angularity… ” (emphasis added). These are examples of how black citizens were able to craft and assert their own unique cultural heritage through dance. The Congo Square draws upon West African dance but mold it into their own through different interpretations of body movement. This style of dancing greatly differed from West European dance style as well, due to its increased freedom of expression. The Congo Square exemplified “innovation, cultural strength, and aliveness that continued to define the spirit of music and dance that permeated both Jazz and Baby Doll life” (emphasis added). Therefore, the words given represent what the Baby Dolls embody as a group during a time of racism and segregation. Additionally, the Baby Dolls are able to assert their space through peace and care in the streets instead of violence. The Third of May by Goya. These words also correlate to Prince’s art pieces. The first composition I thought about was Requiem for Brother John. In this composition, I see unity with the people of New Orleans mourning over a loved one. I see their different emotions with their grief. Most of all, I see how grounded they are with their culture and heritage by doing the funeral march to bring peace and aliveness in their lives. Another composition that was brought to my attention to analyze more was Stand at the Gretna Bridge. During class, we analyzed The Third of May, a Spanish painting from 1808 by Goya that is the first modern depiction of war. 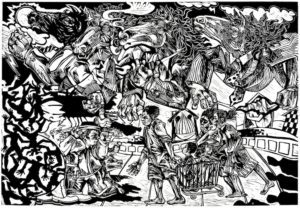 This painting influenced Prince’s woodblock piece with the humanity aspect. Prince shows the conflict of two sides: the police and the civilians that live in New Orleans. 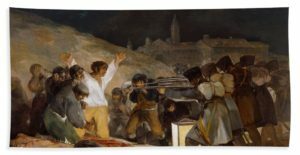 This conflict is portrayed through the body movement of the cops’ angry facial expressions to the victims’ hands open almost saying “I am no threat.” The contrast that Prince does from Goya is that he brings attention to the facial features of both sides of the story. In addition, he changed the focal point of the piece to be a civilian having their arms down instead of up like Goya’s artwork. Additionally, the two sides of conflict are blurred in Prince’s work but not with Goya. I believe Prince’s compositions show the seven words that were brought to our attention in class. Although it may not be written out in his works, I believe his message reaches his viewers. I realize that Stand at the Gretna Bridge is a very powerful composition that I cannot fully unpack in this blog post. I may, in a future blog post, attempt to unpack the art piece as much as I can to better grasp Prince’s mindset for this piece. Walking out of class, I felt that the Teaching Assistants, Katie, Anderson, and Sabrina, did an excellent job with educating us of a different piece by Steve Prince and draw our own connections with the words in the Human Clay exercise. Leaving class, I felt that I have firmly grasped the task assigned and took it past its first intentions.